This year’s spring fling was one of the more interesting ones for me in a while. I was happy to get away for the stress of work and just be in the woods with no access to my work computer or cell phone for a few days. The prediction had been for rain so I think we all planned more for leisurely trail riding and hanging out at camp. Neal and Frosty built a huge shelter so we could hang near the fire in the rain. It also provided nice shade during the sunny times. We also had a couple of EZ ups for shelter as well. Evan and I arrived Thursday noon. Neal, Frosty and Derek were already there. We made it out onto the trails Thursday afternoon. 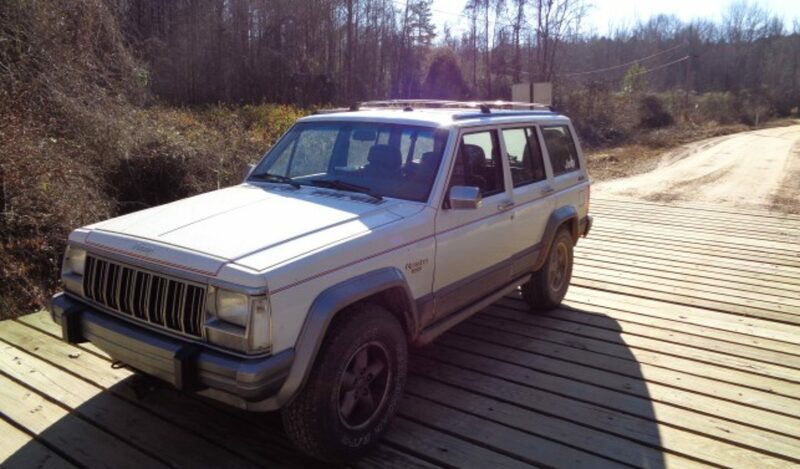 Evan is now wheeling the chop top long arm XJ that Josh built. As a training exercise, we headed to lower rock garden. We made our way there via, trail 45 up the mountain from the Harlan County Campground. Trail 45 is becoming quite a challenge itself. We then took trail15 with is not too bad when dry and dusty. I managed to find the elusive 15 connector that we always seem to miss and dropped us down to trail 20 to get to lower rock garden. We watched Evan begin to explore the capabilities of his new rig. About five minutes in he found the limit of the tie rod. Both front tires got a good bite while the rear was hung and just toed in making a big arch in the tie rod. We removed the tie rod from Evan’s Jeep and used a winch and Frosty’s metal working skills to get it straight enough. We made some calls for spare parts to be delivered by the later arrivals and then headed to Killin’ Time. I had never run this trail before. It is a short run just above the lower rock garden. The change in terrain in such a short distance is amazing and one of the things I like most about Harlan. While the rock garden was flat and dry, Killing time was steep and sloppy wet. Neal hopped in an powered through the mud and up and over the rocks on his 38” swampers. My 33” Buckshots required finding some more gentle lines and eventually the winch cable to get up some of it. This was a very fun run for all of us. We attracted quite a crowd of spectators in the parts that can be seen from the parallel road. This viewing point is another thing that makes this a fun trail since once you exit you can come back and watch those behind you run. We then headed back to camp and enjoyed our set up. The next morning, we used a piece of water pipe donated by Adam to sleeve Evans bent tie rod. We then made a decision to go explore some trails that we have missed in the many years we have been going to Harlan. According to the map, we saw there was a middle downhill trial leading out of middle fork that I had never run. I lead us onto that one with no promises on not getting lost. I managed to lead the group to a nice lunch spot close to where I thought we were on the map. After our on trial lunch, we moved on to Your Turn. We dove in knowing that we could likely not make the exit. Your Turn is nice and wide so there are multiple lines. None of them are easy. We worked Evan and Derek over the big ledge in the last third of the trail when we caught up with another group of Jeeps. They had gotten stopped by a tree across the trail even before the impossible exit. They chose to take a bypass to the right that involved a long narrow winch run. We chose the left exit. All of use but Derek had to winch past a big rock with an under cut. When my winch stopped working at a critical moment, Red turned his rig around and set up to winch me and the rest up the last few feet. His new synthetic winch line got a lot of use this weekend. Derek was able to go wide and powered over the rock. We waved him on to the last point where most of us had also winched. He carried more speed than any of us had and ended up on his side. It took a bit of rigging but we were able to get him back on his wheels pretty quickly. His exo cage saved him from any new damage. But somewhere along the way he developed a brake line leak that slowly consumed his brake fluid. We then looped back around to the entrance and continued exploring new trails. Next was trail 8. It does not have a name like some of the tougher ones. But it is coded orange (difficult) on the map. I soon found out why as I headed up. The trail has some very long very steep climbs. They would be much tougher if it had been wetter. Eventually we all made it to the top. Then we decided to try T_R_O_U_B_L_E. I have wanted to run this one for a while also. But were had never seemed to be able to find it. It was right at the top of 8 so no trouble finding it. The gate keeper is a steep dusty climb with a undercut rock right at the top. The ruts were deep enough for me to drag my diff. I tried hopping out of the ruts at the last second to hop over the rock but it did not work. I had to call for assistance in pulling my winch cable to make it over the ledge. Frosty got behind the wheel of Evans rig and tried the right side line. He needed up getting scary sideways and we winched him to safety. Kim then drove Frosty’s Toyota up. Just as the trail got really steep at the top she stalled and then found neutral. She took a scary roll backwards several feet before getting it stopped. After seeing our struggles the rest of the group decided to bypass and meet us at the end of the trail. I explored an unmarked short cut that took us right were we wanted to go and we made our way back to middle fork and then down the mountain.